This study examines the impact of the formalization of the labor market on social security deficits in Turkey. After a brief discussion on the causes and consequences of the informality of the economy, the paper reveals the effect of possible developments in the labor market, --such as the reduction in informal employment, the decrease in contribution evasion, and the increase in youth employment and womens employment-- on the deficits, which has increased since the early 1990s. To assess the effect, we utilize a simple actuarial model to project the deficit through 2050 under different scenarios. The results point to the importance of increasing female labor force participation, preventing evasion of social security contributions, and show the effect of an ageing population. Bernabe, S. (2002). Informal Employment in Countries in Transition: A conceptual framework. CASE Paper No: 56, London School of Economics. Bozkus, C. and Elveren, A. Y. (2008). An Analysis of Gender Gaps in the Private Pension Scheme in Turkey. Ekonomik Yaklasim, 19 (69), 89-106. DOI: 10.5455/ey.10677. Bulutay, T. and Tasci, E. (2004). Informal Sector in the Turkish Labour Market. Turkish Economic Association, Discussion Paper 2004/22. Deger, C. (2011). Pension Reform in an Overlapping Model with Multiple Social Security Systems. Ege Academic Review, 11(4), 563-72. DPT (The State Planning Organization). (2001) Kayitdisi Ekonomi Ozel Ihtisas Komisyonu Raporu. www.dpt.gov.tr, last accessed May 12, 2010. Elveren, A. Y. (2008a). Social Security Reform in Turkey: A Critical Perspective. Review of Radical Political Economics, 40(2), 212-232. DOI: 10.1177/0486613407310561. Elveren, A. Y. (2008b). Assessing Gender Inequality in the Turkish Pension System. International Social Security Review, 61(2), 39-58. Elveren, A. Y. (2010a). Wage Inequality in Turkey: Decomposition by Statistical Regions, 1980-2001. Review of Urban and Regional Development Studies 22(1), 55-72. DOI: 10.1111/j.1467-940X.2010.00169.x. Elveren, A. Y. (2010b). The formalization of the labour market and social security deficits in Turkey: What should be done?. 6th International Policy and Research Conference on Social Security, the International Social Security Associations, Luxembourg, 29.9-1.10.2010. Elveren, A. Y. (2015). Financing the Welfare State in Turkey, in Financing Welfare State Systems in Asia, edited by Peter Whiteford and Christian Aspalter, Routledge Studies on Social Welfare in Asia, Routledge. (forthcoming). Elveren, A. Y. and Galbraith, J. K. (2009). Pay Inequality in Turkey in the Neo-Liberal Era 1980-2001. European Journal of Comparative Economics, 6(2), 177-206. Elveren, A. Y. and Hsu, S. (2007). Gender Gaps in the Individual Pension System in Turkey. The University of Utah, Department of Economics, Working Paper No. 6. Hussmanns, R. (2004). Defining and measuring informal employment. Bureau of Statistics, International Labour Office, Geneva. ILO, International Labor Organization. (1995). Turkish government social security and health insurance project. The Undersecratariat of Treasury. KADIM. (2010) Kayıt Disi Istihdamla Mucadele (KADIM) Projesi (The Project of Fight Against Informal Employment). http://kadim.istanbul.gov.tr/Portals/Kadim/images/ proje.pdf, last accessed May 12, 2010. Kan, E. O. and Tansel, A. 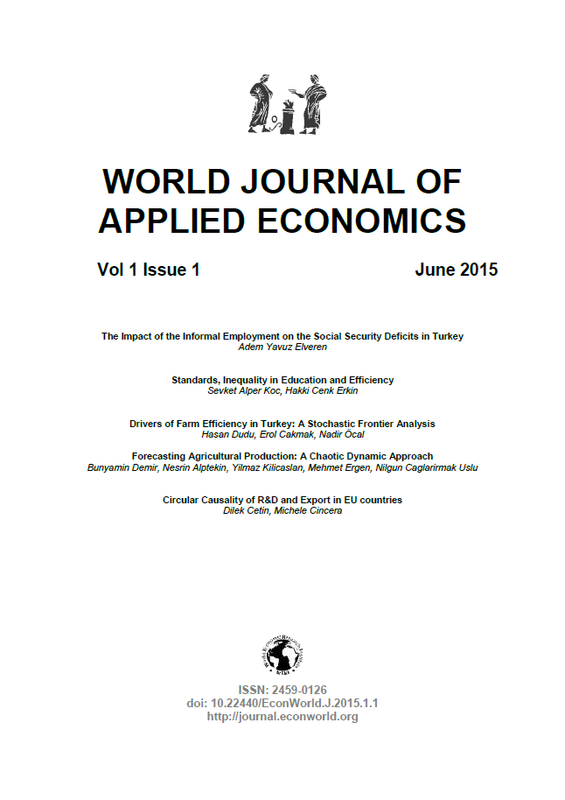 (2014) Defining and Measuring Informality in the Turkish Labor Market. MPRA Paper No. 57739. Karadeniz, O. (2009) Annual National Report 2009 Pensions, Health and Long-term Care Turkey. ASISP. Maloney, W. F. (2004) Informality Revisited, World Development, 32(7), 1159-1178. DOI: 10.1016/j.worlddev.2004.01.008. OECD. (2009). Economic Outlook 86: Taxing Wages. DOI: 10.1787/832724381465. OECD. (2014). OECD Website. www.oecd.org. Oviedo, A. M. (2008) Economic Informality: Causes, Costs, and Policies A Literature Survey of International Experience. report prepared for the Turkey Programmatic Growth CEM Economic Informality and Growth. Onder, I. (2001). Kayitdisi Ekonomi ve Vergileme, I.U. Siyasal Bilgiler Fakultesi Dergisi, No-23-24. Pamuk, H and Teksoz, T. (2008) Isgucu piyasasindaki yapisal donusum ve kayit icine gecis sureci. TEPAV Degerlendirme Notlari, 2008- 790, www.tepav.org.tr. Perotti, V. and Puerta, M. L. S. (2009) Personal Opinions about the Social Security System and Informal Employment: Evidence from Bulgaria, SP Dicussion Paper No: 0915, The World Bank. Perry, G. E., Maloney, W. F., Arias, O. S., Fajnzylber, R., Mason, A. D., and Saavedra-Chanduvi, J. (2007) Informality: Exit and Exclusion, The World Bank: Washington, D.C. DOI: 10.1596/978-0-8213-7092-6. Ronconi, L. (2007) Enforcement and Compliance with Labor Regulations, Ph.D. Dissertation, UC Berkeley. Sak, G. (2008) Nasil oluyor da ekonomimiz kayit icine giriyor, Referans Gazetesi (Turkish National Daily Newspaper), 12/04/2008. Sayan, S. (1999). Turkiye'de Yaslilik (Emeklilik) Sigorta Prim Kacaklarinin Toplumsal ve Bireysel Maliyetleri. ASO Medya, Eylul 1999, 40-54. Schneider, F. and Enste, D. (2000). Shadow Economies: Size, Causes, and Consequences. Journal of Economic Literature, 38, 77-114. DOI: 10.1257/jel.38.1.77. Social Security Institution (SGK) (2004). Proposal for Reform in The Social Security System. Draft Text, July 2004. Straub, S. (2005). Informal Sector: The Credit Market Channel. Journal of Development Economics, 78, 299-321. DOI: 10.1016/j.jdeveco.2004.09.005. Sahin, S. and Elveren, A. Y. (2014). A Minimum Pension Guarantee Application for Turkey: A Gendered Perspective. Journal of Women, Politics & Policy, 35(3), 242-270. DOI: 10.1080/1554477X.2014.921542. Sahin, S. and Elveren, A. Y. (2011). Assessing a Minimum Pension Guarantee for the voluntary IPS in Turkey. International Social Security Review, 64(3), 39-61. DOI: 10.1111/j.1468-246X.2011.01401.x. Sahin, S., Rittersberger-Tilic, H. and Elveren, A. Y. (2010). The Individual Pension System in Turkey: A Gendered Perspective. Ekonomik Yaklasim, 21(77), 115-142. DOI: 10.5455/ey.20039. Taymaz, E. (2009). Informality and Productivity: Productivity Differentials between Formal and Informal Firms in Turkey. ERC Working Papers in Economics No. 09/01, Middle East Technical University, Ankara. Taymaz, E. and Ozler, S. (2005). Labor Market Policies and EU Accession: Problems and Prospects for Turkey, in B. Hoekman and S. Togan (eds. ), Turkey: Towards EU Accession, The World Bank and CEPR, pp.223-260. TISK (The Turkish Confederation of Employer Associations). (2003). Kayitdisi Istihdam. Yayın No. 233, http://www.tisk.org.tr/yayinlar.asp?sbj=ana&ana_id=41. Turkstat (The Turkish Statistical Institute). (2014). Household Labor Force Survey (2001, 2006, 2009). available online at www.tuik.gov.tr, accessed on 16/12/2014. Turkstat (The Turkish Statistical Institute). (2008). Results of Structure of Earnings Survey. online at www.tuik.gov.tr, accessed on 05/05/2009. Ulgen, S. and Ozturk, U. (2006) Kayitdisi Ekonomi ve Surdurulebilir Buyume: AB Yolunda Degerlendirme ve Cozum Onerileri, TUSIAD Report No: 2007-01/428. Winklevoss, H. E. (1993) Pension Mathematics with Numerical Illustrations, Second Edition, Pension Research Council and University of Pennsylvania Press: Philadelphia. World Bank. (2006). Turkey: Country Economic Memorandum - Promoting Sustained Growth and Convergence with the European Union. Report No. 33549-TR, Volume II: Expanded Report. Yamada, G. (1996) Urban informal employment and self-employment in developing countries: Theory and evidence. Economic Development and Cultural Change, 44, 289-314. doi:10.1086/452214.